Tandem Bungee Jumping Madness! 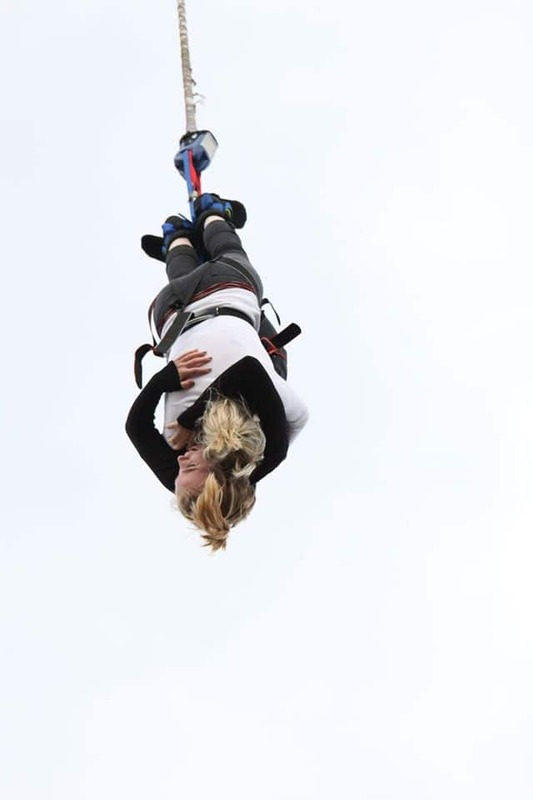 This is a Bungee Jump Experience for two people - take a 160ft leap of faith with a friend or loved one! 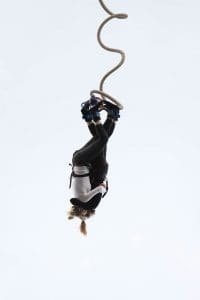 Attached by your ankles, share the bungee jumping experience! One of the ultimate adrenaline rushes shared with a friend or loved one, ahh bless! There is very little out there to match the pure adrenaline rush that leaping from a 160ft platform provides, safe in the knowledge that you arte attached with an elastic band around your ankles! You even get to enjoy a few seconds of picturesque scenery before the big plunge! Once your descent has begun and the ground flashes quickly before your terrified face, the cord reaches its full extension and you involuntarily recoil skywards again with massive G force! Queue the uncontrollable grin and laughter born of a mixture between fear and shock! You will then gently bob around for a few seconds before being lowered back to the ground with a smile from ear to ear. 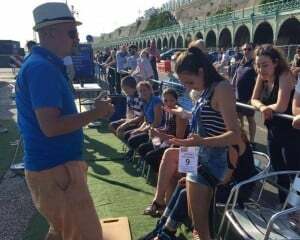 This experience will leave you wired - guaranteed!Once you've arrived and been welcomed to the centre you will be required to complete a Bungee Jump membership form. You will then be weighed twice, ensuring that the correct bungee rope is used for your jump. It is then time for you and your friend to get harnessed and strapped in by the ankles! The professional instructors are uber-safety-concious and perform extensive safety checks, further extending your anticipation of what's about to come! You will then enter the cage where you will be lifted to a height of circa 160ft. Now all you have to do is jump off! There will be a personalised DVD and merchandise available for you to buy on the day to remember your experience with. Selected dates throughout the year at various locations. Please call upon booking for specific availability. Participants: The Tandem Bungee Jumping is for 2 participants. I have always told myself I would never be able to do a bungee jump. However, when the opportunity came about I felt I couldn't say no. This was one of the most daring things I have ever done, but looking back now I am soo glad I did it. It was such an amazing feeling and I will definitely be doing one again- maybe with my eyes open next time. It was a present for my boyfriend's 18th birthday and we did a tandem bungee jump over Bristol river. It was an amazing experience and I would advice anyone thinking about it to go for it. It is a brilliant achievement. tie your shoes up tight though; my boyfriend lost his in the river. was the most scariest but brilliant things i have ever done!! Done the bungee jump this summer with one of my dear friends, possibly as crazy as I am just as a farewell London day out! Looking back now, I guess living for 3 months in the country side (even if next to one of the most spectacular beaches in the country) was a little crazier decision, so back to city life now. The day was a complete success: waking up in the morning after a late shift and a little after work session, a relatively short train journey and taxi to the lake, the jump, the company I had... All was perfect! 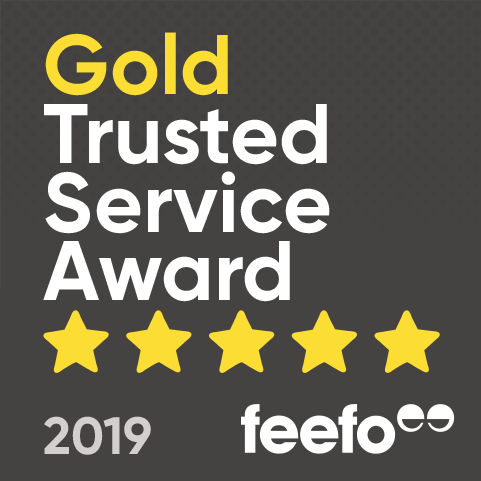 Staff on the day were really nice and friendly and made the whole experience look like a very easy and accesible thing to do. The jump was absolutely amazing: strapped to a crazy girl, up on a crane, lifted 150ft over the lake and after the plunge! The feeling is mind blowing!!! I was laughing like a maniac all the way down, then back up, and down again! It was awesome! All I could say when we made it safely down was: "I want back again!!!". Poor girl was half deaf from my laughter, but she loved every second of the experience! The location is quite pretty and we took the oportunity to have our packed lunches by the lake in a hidden little spot, soaked it with cider (bare in mind, it is a good walk to find booze around there), later soaked with rain so my waterproofs came in handy, though quite tricky to share! After the rain finally chased us away from the lake we made it in to town and started what proved to be a very tricky pub crawl: not too many nice pubs around (unless you're 18 and like music banging in your ears) so after a few attempts (I do have to say we did find one with a pretty beer garden) we were headed back to London and to my old local on Connaught Street! The day was a real success; it had everything a bloke would want: a little adrenaline rush, a girl, and the pub crawl! Looking forward for the next jump, and I am quite disapointed with myself for missing the 300ft one! Sometimes work does get in the way of having fun! But highly recomended experience! Can make a very good day of it if planned right! And for a tandem jump: cheap as chips! Go for it! My best friend and I did this to celebrate my 20th birthday...the staff were all really friendly and the jump itself was as fun as it was scary! We both agree we want to jump again, but separately for more of a buzz! 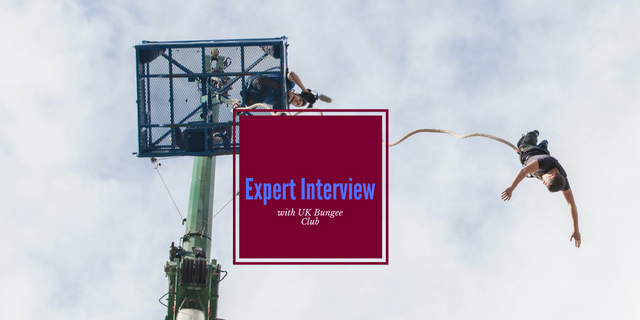 How can I check the availability for the tandem bungee jump? 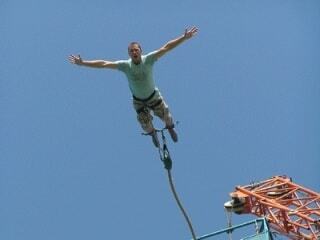 The dates for each location of the bungee jumping can be found on the "Availability" tab of the experience page. To check the remaining availability on any specific date, please contact our customer service team.